Place your water kefir grains, water and sugar into your large glass container. Optionally add egg shell, molasses or sucanat/rapadura. Cover the jar and place in a warm area (70°-80° Fahrenheit), out of sunlight, for approximately 48 hours. After 48 hours, strain the grains using a fine mesh strainer and place the grains back into the jar. Repeat the feeding process for your grains. Your water kefir is now ready to be used. Place your prepared water kefir from the first fermentation (previous steps), optionally add in flavorings (juices, fruit pieces, tea, etc. ), into a tight sealing bottle (check here for bottle recommendations) and let sit for several days to build gas for a fizzy soda like drink. This can take between 1-5 days depending on the temperature. 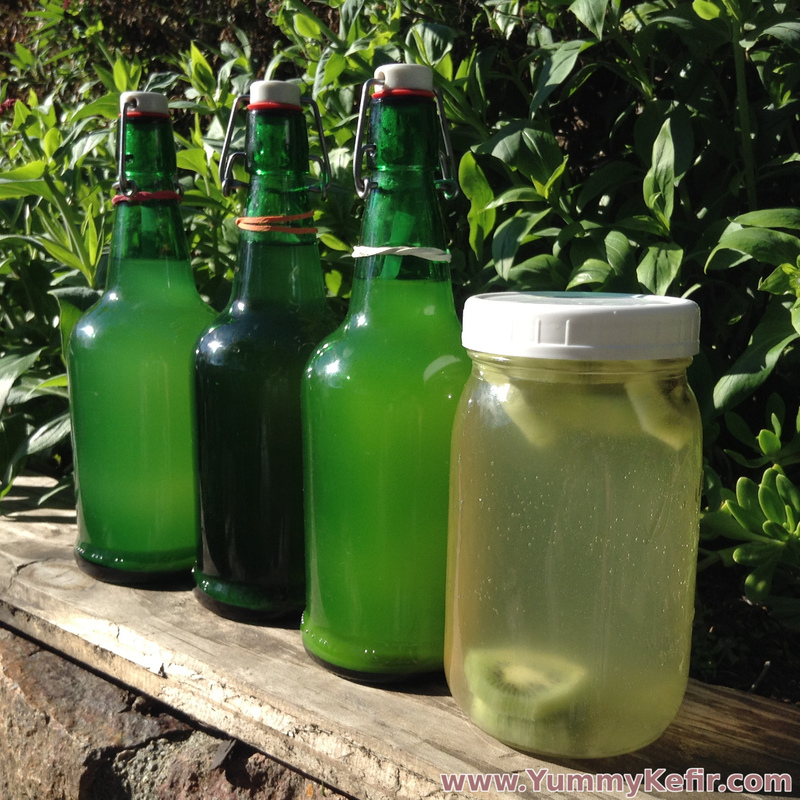 Click here for water kefir recipes. After the fizz has built up to your liking, refrigerate the water kefir. This will slow down the fermentation of the drink, however it will still continue to ferment, so if left for an excessive amount of time it can become alcoholic. It is important to use the proper bottles, ones specifically meant for storing items under pressure. Using bottles not meant for pressure can result in explosions which can mean serious injury to you or others in your home. Click here for the bottles we recommend you use with your water kefir. Burp your bottles to get an idea of how much pressure is building, do this every 8-12 hours until you get an idea of when they should be refrigerated. If you are having trouble with your water kefir, please visit our water kefir FAQ. Visit this link for water kefir recipes.